Easy, quick, and accurate. Just the way you like it. Mobile Convenience keeps you flying while giving you the the tools to find the best fuel prices for your flight. Spend more time flying and less on fuel costs. One Time Fee of $3.99! Fuel Prices in your hand! A great App created to give pilots accurate Fuel prices around the country at any given moment. 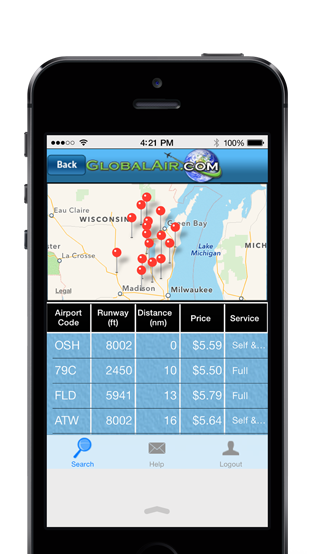 Developed by GlobalAir.com, this convenient application will give you current Fuel prices from over 3,200 FBO’s nationwide. With our great reliable app get the lowest fuel prices in your area! How much is this cool app? $3.99 - Pays for itself in just one fill-up. Learn More How do you keep your fuel prices current? Only the FBO’s can update their fuel prices and are required to update at least once every 30 days. Learn More Is it available for on the iPad? Yes, it's availble for iPad, iPod touch and iPhone.